A teenage brother and sister create an intense, private world in their untidy shared single room, until outsiders intrude, setting the scene for tragedy. In this compelling tale of incestuous obsession, a teenage brother and sister, Paul and Elisabeth, create an intense, private world in their untidy shared single room. Within the room, they live, sleep, argue and play out their erotically charged games without heed to the real world going on around them. However, when outsiders intrude into their intensely private realm, the scene is set for tragedy. 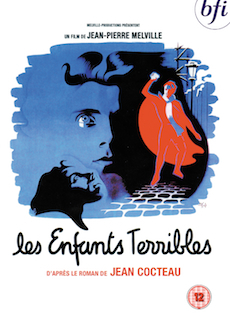 A hauntingly atmospheric film of Jean Cocteau's 1929 claustrophobic hothouse novel, for which he also wrote the screenplay and provided the voice-over, Les Enfants Terribles is dominated by a performance of fierce intensity by Nicole Stephane as the scheming heroine Elisabeth. The music by Bach and Vivaldi forms the film's impassioned score. Les Enfants Terribles brought two very different film-makers together for the first time – the mercurial, multi-talented Jean Cocteau and the single-minded, self-sufficient Jean-Pierre Melville. The pair disagreed over casting, scoring and several other elements, but from their clashes there emerged a unique film that is as true to Cocteau's vision as to Melville's. The film's main themes were a key influence on Bernardo Bertolucci's controversial film The Dreamers (2003) and Gilbert Adair, who wrote the screenplay for The Dreamers (based on his book The Holy Innocents), provides the commentary for this DVD. Commentary by novelist, critic and screenwriter Gilbert Adair. Interview with actress Nicole Stephane.